No side-effects, no synthetic drugs, no function impairment, no lactose. Helps make occasional, minor anxious feelings less frequent or eliminates them altogether. It helps you feel less vulnerable to the minor annoyances that make up your daily life. And it works without side effects, synthetic drugs or function impairment. For some it can be an overwhelming sense of apprehensive or uneasiness of mind. Or it can be worrisome thoughts and tension and sometimes panicky feelings about the ordinary stresses associated with everyday routine life events and activities. In any case, it is an undesirable sense of uneasiness that may be accompanied with self-doubt about one' capacity to cope with it. An anxiety sufferer may anticipate something worse even though there is little reason to expect it. Stress is a term widely used in our current fast-paced society. Often the daily demands placed on us build up and accumulate to a point where it becomes very challenging to cope. Job pressure, family arguments, financial pressures, deadlines, etc. are common examples of 'stressors'. I can be almost anything which creates a disturbance, including something physical or emotional. Anxiety is one of the most common feelings in America today. More than 30 million people in America experience some form of anxiety each year. Women are twice as likely as men to develop panicky feelings which typically strike in young adulthood with the median age of onset occurring at 24 years. Children and adolescents can also experience daily anxiety. Anxiety costs the U.S. billions in direct and indirect costs annually. One survey found that people experiencing panicky feelings, make more trips to their health care provider than the general population. Contains the highest quality, all-natural formula in strict compliance with the Homeopathic Phamacopeia of the United states. Homeopathic medicines have demonstrated unsurpassed safety for nearly 200 years, and are safe for children, the elderly, and pregnant and nursing women. For the symptomatic relief of occasional minor anxiety, fear, anguish, stress and worry associated with ups and downs of everyday life. Adults and children 12 years of age and older: Chew 2-3 pleasant tasting tablets 3 times daily and allow to dissolve in the mouth. 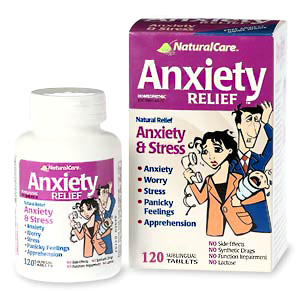 If you are experiencing "panicky feelings", you may safely take 2-3 tablets every 30 minutes until symptoms improve. Children 2-12 years of age: Chew 1-2 tablets 3 times daily, or as directed by a doctor. For best results take nothing else by mouth 10 minutes before and after dosage. Active Ingredients: St. Ignatius' Bean (Ignatia Amara) 6X, 12X, Sea Salt (Natrum Muriaticum) 6X, 12X, 30X, Kava Kava (Piper Methysticum) 3X, 6X, 12X, 30X, Silver Nitrate (Argentum Nitricum) 8X, Yellow Jasmine (Gelsemium Sempervirens) 8X, 30X, Musk (Moschus) 12X, Potassium Carbonate (Kali Carbonicum) 12X, 30X, Gold (Aurum Metallicum) 8X, Arsenious Oxid (Arsenicum Album) 8X, Aconite (Aconitum Napellus) 9X, Henbane (Hyoscyamus Niger) 6X, 12. Julie "It saved my life"
I really really love this product! It has saved my life. It's the best thing that ever helped to me. I can't believe how fabulous I feel with your anxiety medicine, and it doesn't interfere with my other medications. Your anxiety product is amazing! It worked within a week and with no side effects. I have tried your anxiety medicine and love it! I tried all the prescription drugs and nothing helped until your anxiety came out. It's a great product! Katherine "Cures my stress immediately"
It is wonderful to find something that cures stress immediately. You have a wonderful product. My doctor will hear about it. Connie "Works better then anything else"
I have a lot of stress and anxiety, and within 10-15 minutes your Anxiety works for me. It works better than anything else. Thanks for making such a good product. 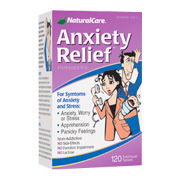 Anxiety Relief is shipped in a discrete, unmarked package. Orders are processed immediately and usually take about 3 to 5 working days to be received. We do ask that you try it for 2 to 3 weeks to feel the full effects. Any information received is used only for order processing and shipping purposes. Your information, such as e-mail address, will never be disclosed to a third party.